Use the links down the right side of this page to find the Times Two Speed File for you. All units are available for online purchase, but you always call at 800-326-4403 for any kind of help. 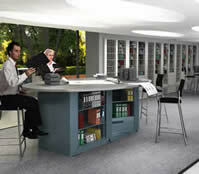 Two Sided Shelving System. Saves Space! 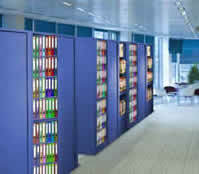 A Times Two Speed File System will save you space over traditional stationary shelving. These types of files allow you to put two rows of shelving against a wall where normally only one would fit. This is due to the rotation of the unit, allowing someone to access one bank of shelving, and then by simply pressing a foot pedal, rotate the shelving 180 degrees to access an entirely different bank of shelving. 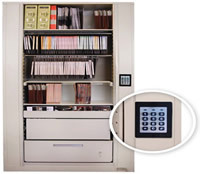 Also, by rotating these units only 90 degrees, they can be locked, making them great for securing private documents, and HIPPA compliant. Times Two Speed Files are the original and still the best on the market today. While there are a number of imitators, none perform year after year as smooth and effortlessly as the original Times-2 units. 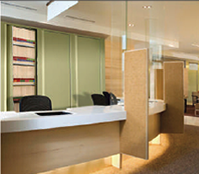 No other units are as aesthetically pleasing offering the furniture quality Gloss-Tek™ textured powder coat finish in 32 standard colors, and cabinet quality unmatched by any other Rotary manufacturer. The base assembly is the foundation of the rotary unit. The Times Two Speed Files unit is fully manufactured, assembled, lubricated, and sealed for the life of the unit before leaving the factory in Aurora, IL. It is equipped with either a foot pedal of a hand control which provides positive position control. Most competitors do not offer this safety feature, which is built into every Times Two Speed Files. The positive position control ensures a controlled and positive stop every quarter turn. It prevents the rotational momentum that can occur with other units that are free spinning push models. Although most customers prefer the foot pedal, Times Two Speed Files offer a hand controlled release handle instead as a no-charge option. Times Two Speed Files use the same standard divider for both letter and legal units. 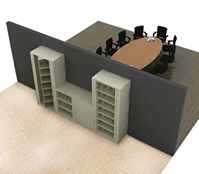 In addition, there are dividers sized to accommodate extra tall or extra short media. 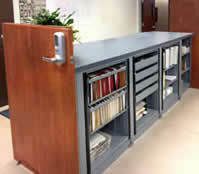 There is a divider to hold tabloid size magazines upright as well as shorter dividers to customize your units as needed. Times Two Speed Files feature a limited lifetime warranty. This warranty includes the base, rotor, and rotor top which are often excluded from other manufacturer’s lifetime warranties. The Spacesaver Rotary base is manufactured by another party for them. This can lead to potential quality control issues. They also offer a foot pedal, but no hand release control unless you opt for a very costly digital keypad, which Aurora also offers. The Mayline ARC Rotary base is shipped in pieces and must be assembled in the field, requiring precious job-site installation time and disruption. Ball bearings must be placed by hand in cups around the base. The base stop cup and spring loaded plunger must also be installed, and then everything must be heavily greased. Not an ideal procedure to be performed at all locations. Mayline has no foot pedal. Instead they have a spring-loaded plastic plunger which aligns with notches in the rotary base every quarter turn to provide a detent. They do not have a positive stopping mechanism. Mayline also has cantilever style shelves which hang off of center posts. Datum shelves must be attached with 4 screws which must be removed and reinstalled as the shelves are moved. Datum also has no foot pedal, only detents every quarter of a turn. Direct Line also requires their shelves be screwed into place, and like Datum, they must be also be removed and reinstalled whenever a shelf needs to be repositioned. Direct Line also has no foot pedal, only detents every quarter of a turn. In addition, their vinyl side filler strips are held in place using 2-sided tape. 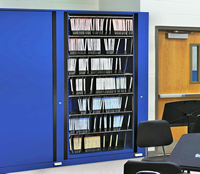 Whether equipped to store and secure items for school nurses, security officer’s weapons, files, or anything you can imagine, Times Two Speed Files is the best rotary storage unit on the market. Advantage: Aurora. Times Two Speed Files, the original rotary cabinet, is still the best on the market today. While there are a number of imitators, none perform as smoothly and effortlessly as the original Times-2. The base assembly is the foundation of the rotary unit. The Times Two Speed Files base unit is fully manufactured, assembled, lubricated, and sealed for the life of the unit before leaving the factory. It's equipped with either a foot pedal or a hand control, both of which provide Positive Position Control (PPC). Most competitors do not offer this safety feature, which is built into every Times Two Speed Files. PPC ensures a controlled and positive stop every quarter turn and prevents the rotational momentum that can occur with other units that are free spinning push models. The Spacesaver Rotary base is manufactured by an outside party. This can lead to potential quality control issues. They also offer a foot pedal, but no hand release control. The Mayline ARC Rotary base is shipped in pieces for assembly in the field requiring additional installation time. Individual ball bearings, the base stop cup and a spring loaded plunger must be installed and then all must be heavily greased. Not an ideal procedure when installing in finished applications. Mayline has no foot pedal but uses a spring-loaded plastic plunger which aligns with notches in the rotary base every quarter turn to provide a detent. They do not have a positive stopping mechanism. Mayline also has cantilever style shelves which hang from the center posts. 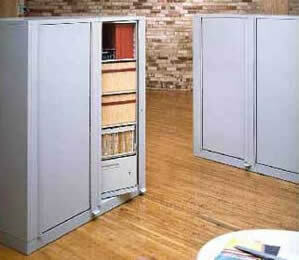 The Datum Rotary has shelves that attach with 4 screws which must be removed and reinstalled as the shelves are moved. Datum also has no foot pedal, only detents every quarter of a turn. Direct Line's Rotary requires shelves be screwed into place; screws must be removed and reinstalled if moving a shelf. Direct Line has no foot pedal, only detents every quarter of a turn. In addition, their vinyl filler strips are held in place with double sticky tape. The quality of Times-2 is unmatched by any other manufacturer. Whether equipped to secure items for school nurses, security officer's weapons, files, or anything else, Aurora Times-2 is the best rotary storage unit on the market.